Judge Nelson set aside today and tomorrow for a Frye hearing regarding the admissibility of expert testimony about the death shriek and a hearing on the defense motion for sanctions and a judicial inquiry into alleged discovery violations by the State. Not sure which order she plans to hear these motions, but I am sure we will find that out when the hearing starts in about 25 minutes @ 9 am EDT. Due to inclement weather, Crane and I have decided not to take our computers with us on our trip to TN for a doctor’s appointment. We will be with you for the first 1.5 hours and catch up with you later after we return. Today’s hearing was a judicial slam-down of the defense motions. The most important thing that happened was the defendant’s waiver of the immunity hearing. After Judge Nelson placed him under oath, he acknowledged that he knew he had a right to a pretrial immunity hearing and he voluntarily waived that hearing. In my opinion the waiver is bullet proof and will withstand appellate scrutiny. At the press conference following the hearing, Mark O’Mara said that they had decided to waive the hearing because it would be better to let a jury decide the case. In my opinion, his explanation is pure spin designed to conceal that he knows his client’s credibility will be destroyed on cross examination. In other words, the defense has no defense. BOTTOM LINE: He would not have waived the hearing, if he thought he had any chance to win. That overwhelming case for self-defense that O’Mara has been bragging about for almost a year is a bust. He folded when Bernie called his bluff. Judge Nelson also ruled that the defense was not prejudiced by any of the alleged discovery violations, but she postponed consideration until after trial of whether to order the State to reimburse the defense for fees and costs incurred by alleged delays in providing discovery. After Mark O’Mara questioned Don West on direct regarding the alleged discovery violations, Bernie de la Rionda did a nice job cross examining him by getting him to admit that the prosecution and defense discovered some information simultaneously, as in the case of Dee Dee’s hand written letter to Sybrina Fulton that she had placed in the family Bible together with other letters of condolence. West’s effort to make an issue about BDLR failing to disclose that Sybrina Fulton sat next to Dee Dee when she was interviewed also came across as irrelevant nitpicking rather than a Brady violation. 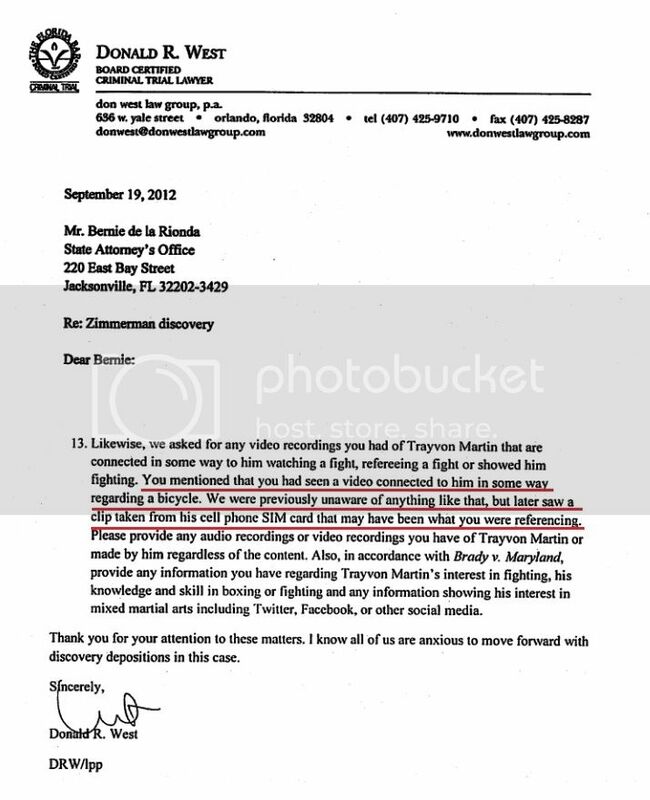 BDLR also nailed West making him look foolish when West could not explain how Dee Dee’s hospital excuse about missing the funeral and wake because she could not face looking at Trayvon’s dead body had anything to do with whether the defendant murdered Trayvon. We also learned today that the State recently sent the recording of the 911 call with the terrified-fear-of-death shriek to an expert to clean/enhance. The expert has not completed the process or issued a report. True to form, Judge Nelson denied the defense motions without providing any basis to support a motion to recuse. The next hearing will be May 28th with motions due no later than May 10th. You are currently browsing the archives for the Motion for Terms and Sanctions for discovery violations category.